Book 44 is unlike any other book published by Dave Burgess Consulting, Inc. This book teaches through a parable, a simple story used to share a lesson. In The Secret Solution, we join Roger Rookie on his first years as principal in a school with underperforming test results. We get a look at the inner-workings of a school, with a cast of characters that looks suspiciously like any school you’d visit. 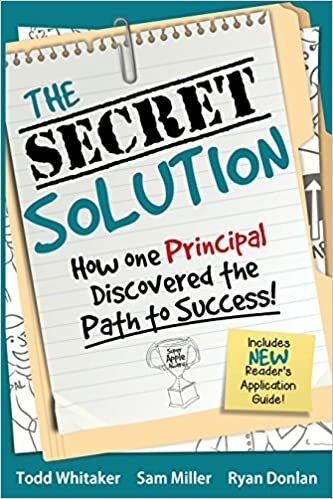 The authors, Todd Whitaker, Sam Miller, and Ryan Donlan, did an outstanding job making this story come to life by sharing the good, the bad, and the ugly of a school and allowing us to have a peak into the mind of the young principal who is finding his way in a fresh position of leadership. In the epilogue, the authors liken this to watching an episode of The Office. It was so funny to read that because I kept thinking the whole time I was reading that the entire book should be a series like The Office where we get to see all the different personalities and their thoughts (usually beside a window in a conference room or in zoomed in camera shots of smirks on their faces). Every character in this book related to someone I’ve worked with; I could put a face to the name. From Judy Slacker who puts a price of everything she does outside of the 7:45-3:30 workday to Karl Chameleon who bounces from group to group to the leaders of the teacher cliques like Mildred Morose and Sandy Starr. Each character is an exaggeration (and sometimes a spot-on representation) of educators across our field. Even though this book appears to be marketed to principals, in particular, new principals or principals of struggling schools, the truths within the parable are applicable to any leadership position. As noted in other DBC, Inc books, leadership can range from being a principal, central office staff, or even a classroom teacher. If you are a classroom teacher, you are leading a group (or multiple groups) of students. One of my biggest takeaways of this book is balance. This may not have been intended, but I kept feeling that balance is the key to being an effective leader. In the book, Roger Rookie’s pendulum swings from absent & unwilling to make the hard decisions, to a positive pollyanna who strives to only praise positivity and neglects to address negative actions, to a drill sergeant who rules with an iron fist. None of these will work because none of them strikes a balance in leadership. Leaders should be present and positive, while addressing behaviors that impede student learning and lead to negative culture. I imagine it’s insanely tough to be an administrator, both at the school and district level. Knowing that it is a statistical impossibility to make everyone happy, while still maintaining (or bless their hearts, building) a positive school culture and instilling a drive for positive scores and growth for accountability. There is a delicate balance that must be preserved in this role. The graphic in the book perfectly showcases how a leader should work to increase climate as they are increasing the accountability expectations. For me, as a non-administrator, I realize that as I raise the expectations in the media center, I need to work harder to create a positive culture that makes my students and teachers want to reach those higher expectations. People will work for those they fear, but they will not love them. People will work for those they love, but they won’t respect them. The goal is that sweet spot, where leaders are loved and respected. I started working at that school in 2016. This is the beginning of the third school year and it would take quite an offer to get me to leave these people now. I love and respect my principal. She is phenomenal and truly has student interest in mind with every decision she makes. She rarely says “no” to my insane ideas, so when she does, I truly step back and reflect on where the lack of student interest can be found. When I dive deep, I can usually see the deficit. She holds me accountable for my insane ideas after saying yes. I am the world’s worst to have a “great idea” then not see it through. (This is part of the reason that #DBC50Summer is so important to me to not only finish, but to finish by my deadline of the last day of summer.) Making these implementation plans is my way of making myself accountable for my learning. When we are successful, she celebrates with us! The teachers are phenomenal. They work hard every single day to encourage students to be their best. They bring their “A-game” and expect others to do so as well. As their instructional coach and media coordinator, my calendar fills up so fast that one of their complaints is that they can’t get time to work with me. The fact that we went from several not even knowing my name, much less my role at the school to filling up my calendar for the first nine weeks of school before students even arrive on campus is telling of the change in culture. Every person is responsible for culture. Every person has grown tremendously in this regard. During a summer training, my principal looked at me with tears in her eyes and said, “They don’t need me anymore.” She was referring to the fact that the teams were co-planning independently of her asking the questions and the PBL units coming out of these PLCs were incredible. I believe that the tears were from both a place of pride and the knowledge that she is close to taking us as far as she can take us as our leader. I am proud to work at my school, and eager to see what this year brings! We made growth for the first time since 2012 this year, and we will shatter that growth at the record we’re already going. I’m excited to see what happens. My implementation for this book is very different from the others. I already know which titles are coming in the final 6 books. Divulging my secret that I mentioned in the DBC Summer Recap 4 is coming soon. Therefore, I will partner this book with another that is coming to create an implementation for both. It seems like a scapegoat or something LaVon Babble (another character in this book) would say, but I promise it will make sense when you see the plan. I would highly recommend this book to beginning principals or principals that are new to a school. It’s a realistic view of how leadership is established and allows us to learn from Roger Rookie’s failures (and boy, does he ever fail). The Secret Solution is a great book for anyone in a leadership role, and really the truths within the book can be applied at all levels. All you’d have to do is substitute principal for teacher and the teachers for students, or principal for director and teachers for principals, etc to receive the same lessons as principals. Hustle on to Amazon and buy your copy of The Secret Solution! Follow along with the conversation at #SecretSolution on Twitter. You can also catch up with their authors on their websites. Ryan Donlan’s website can be found here and Todd Whitaker here. Sam Miller can be found on Twitter here. As always, the flipgrid is available here. This one sounds like fun, so check it out! Andrea Paulakovich was the originator of this amazing space for global collaboration and reflection for every DBC, Inc book and I am fortunate enough to be able to co-pilot this space! I am super pumped about book 45 for many reasons. One is that we already know this author duo and I LOVE them from their first book together, Escaping the School Leader’s Dunk Tank! Yep! Rick Jetter and Rebecca Coda are back and they’re discussing one of my most favorite educational topics: student voice! Buckle up, grab some popcorn, and get your copy of Let Them Speak! I read this book shortly after the initial release at the end of April and whew – it’s a great one! In fact, it’s the first DBC, Inc book that I pre-ordered! I’m excited to share book 45 with you very soon!